There are many potential treatments for lupus currently being studied in clinical trials. 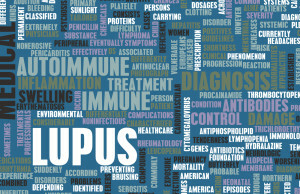 So little is known about causes of lupus that there is a need for a lot more lupus clinical research. Lupus has been around since the 12th century. It is sometimes attributed to the legends of vampires given lupus sufferers’ aversion to sunlight. Lupus is an autoimmune disease that can affect any part of the body. It occurs when the immune system attacks the body’s own cells and tissues. Body parts most often attacked include the heart, joints, liver, kidney, and skin. Women between the ages of 15 and 35 are nine times more likely than men to develop lupus. It is also known as SLE, or systemic lupus erythematosus. There is currently no cure and lupus treatments focus on alleviating the symptoms. The symptoms can come and go in what are known as “flares”. Lupus is believed to be partly genetic and then triggered by environmental factors. The main goal in treating lupus is to manage the onset and severity the symptoms, known as flares. The most common treatment is prescription drugs like corticosteroids and anti-malarial drugs. For extreme cases immunosuppressive drugs are prescribed. These can have bad side effects though, including Cushing’s syndrome, high blood pressure, weight gain, and swelling of the face. Pain killers are also sometimes used for treating lupus. One of the only preventative measures for people with lupus is to avoid sunlight since this can aggravate their condition. Oklahoma Center for Arthritis Therapy & Research, Inc.
Robin K. Dore M.D., Inc.